Played to a small crowd at Station 4 in Lowertown St. Paul last night. We’ve made real progress since I first joined the group in July. I feel like I add the formal musical sensibility and organizational brain to help Dave write the music, making things more concise from a classical/jazz theoretical background. 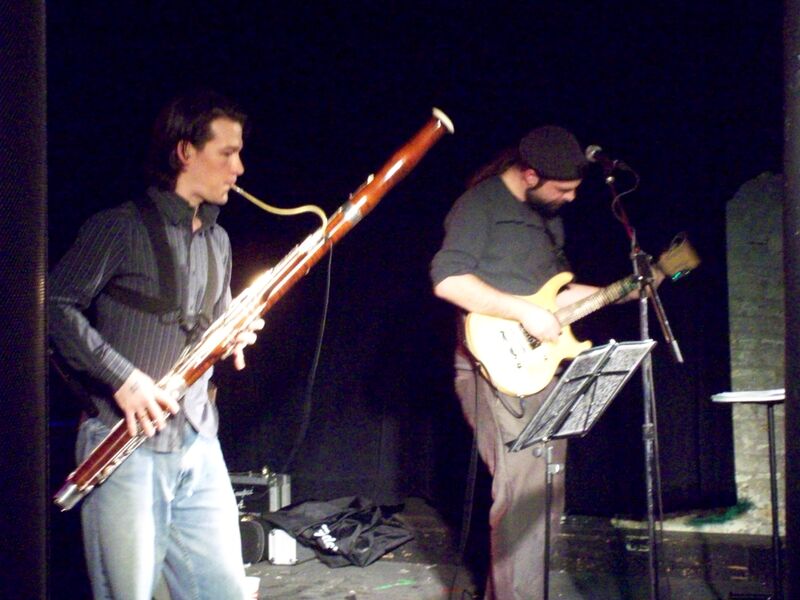 Anyway, the crowd seemed to dig what we were doing, and I got many comments on my electric bassoon playing. Somebody took some pictures but I never found out who they were. If they show up anywhere I’ll post them here. We also got a room recording of the night, so if that came out well I’ll post some sound clips. I left the venue a little after 1am, and found that 35W southbound was closed for a 4 mile stretch around where I live, so I couldn’t take my normal route home. I had so much adrenaline that I didn’t really sleep last night either. Very sleepy all through work. We hopefully have another show at the same venue lined up for November 13. Probably will do a similar set, maybe one or two things slightly different. Really enjoyed the two other groups that played: Thought Thieves with their synthy goodness and Blood Root Mother with a classic bluesy and earthy rock sound.